Why Us? FOLLOWING ARE SOME OF THE REASONS WHY WE ARE SEAFORD’S MOST SOUGHT AFTER CONCRETE COMPANY; Quality Our services adhere to high quality standards. Our technicians are highly trained and experienced which ensures they offer the best services to all clients. You can be guaranteed that we will do a faultless project which won’t develop problems in the future. We don’t just know how to do it but how to do it best. We also use quality materials that result in long-lasting beautiful finishes. Step by step process We have a well laid procedure on how we approach our projects. Every project is divided into steps which our technicians and other staff members follow. We always involve our clients in all stages starting with the initial planning stage all the way to the end. This ensures that your tastes, preferences and objectives are met throughout the project. Affordability Our prices are flexible. Before raising our quotation, we listen to client requirements and expectations and then work with the client’s budget. You can be sure that we will find a way to work around your budget and ensure you get the best service. We maintain consistency in offering high quality concrete services. Call us today and witness our exceptional concrete skills at work. We service Melbourne, Mornington Peninsula, Frankston and Bayside suburbs. Our business is based on old fashioned values. When you contact Integral bathrooms you will speak to an experienced adviser. We will guide you through the steps involved in creating your new bathroom from design to completion. Our team of licensed building and plumbing practitioners meet craftsmanship standards. You’ll find options to suit every style and budget. We will guide you through the steps involved in creating your new bathroom from design to completion. Our team of licensed building and plumbing practitioners meet craftsmanship standards. We can also direct you to suppliers of quality bathroom products sourced locally and overseas. We make and deliver all sorts of concrete, from expose aggregate to plain concrete paving for domestic and commercial concrete. You name it we got it! All sizes of steel mesh crush and other build supplies we got it. We are exposed aggreagate driveways melbourne, we provide the best services to all of Melbourne. We also concrete other types such as charcoal, black and plain. We have years of experience and whether it’s a small domestic or large commercial driveway, we have you covered. WaterPave Australia Pty Ltd supplies and installs an internationally patented resin-bonded permeable paving system which utilizes crumbed “end of life” rubber tyres in the sub-base which would otherwise enter our land fill or waterways. Then a 20mm resin-bonded top layer of crushed Granite and or Marble is applied for a hard wearing surface. This engineered system allows water to pass through into the soil below. Our system is suitable for driveway Tree Protection Zones (TPZ) with a load capacity of 10ton. Also by installing Waterpave’s permeable paving system we are not only capturing our most precious resource WATER, we are also reducing the “Heat Island Effect”, soil erosion, slip and trip hazards and pollution of our waterways. Our system is directly responsible for removing 3 “end of life” rubber tyres from our land fill with every square meter of product laid. Other applications for use are – Carparks, Public access areas, pedestrian paths, cycle paths, courtyards, balconies, tree pits and roof top gardens. At Designer Premix, we pride ourselves on our quality aggregates, the premium look and feel of our mixes and the superior level of customer service. We are a full service business that both sells and lays exposed aggregate mixes. We've been in the concrete industry for 30+ years. We opened a quarry so we could maintain the quality of our product from start to finish. Pebblemix Driveways has prepared and placed thousands of concreting projects around Melbourne. As specialists in Exposed Aggregate, we recognised that there was the need for new and innovative mix designs. We wanted consistently good concrete, we wanted to take the hit and miss out of achieving a faultless finish. So we paired up with a concrete plant in the south eastern suburbs of Melbourne, so that we could control the quality of the concrete going into each driveway we make. This relationship ensures we get priority concrete deliveries, even in peak times. For you, that means your job will be done sooner, and done right. High Grade Concrete Works ensures confidence and trust in every project offered to us. Our projects range from all general concrete work including Exposed Aggregate, Coloured Concrete, House & Garage Slabs, Driveways, Entertainment Areas and more... Providing a clean, safe jobsite means we can focus on tasks, which translates to a healthy working environment and quality work. Our reputation for professionalism and customer satisfaction in our field is important to us and with your vision and our experience anything is possible in acheiving excellence. Metro Mix Concrete (Vic) Pty Ltd.
Offering top-quality concrete products and services in Melbourne, Victoria. 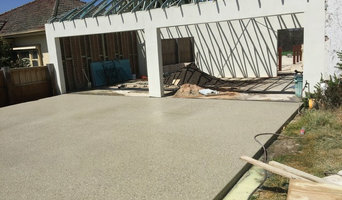 Call us at 03 9551 8890.
www.exposedaggregateconcreter.com.au Prestige Pattern Paving has been servicing Melbourne since 1992. I have more than 35 years of concreting experience and specialise in exposed aggregate, slate impressions, stencil and spray on decorative concreting. I have been on the advisory committee for the Victorian Building and Construction Industry Training Board and helped produce standards in relation to domestic concreting. I have given many lectures at TAFE colleges and building display centers and taught concreting workers courses at a leading Victorian TAFE college. I take pride in my work, and remain passionate about my chosen trade. 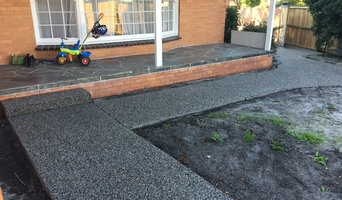 A Better Driveway (previously known as Melbourne Metro Paving) was established on 14th October 1993 and has now been in operation in Melbourne for nearly 21 years, providing effective domestic concrete solutions for driveways, patios, pathways and any other concrete area around the home. 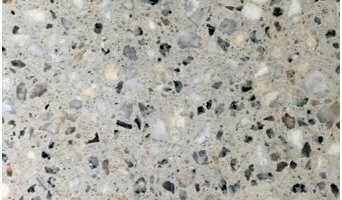 Finishes like exposed aggregate, coloured concrete and others are just a sample of what we specialise in. We can help you with an appropriate shape and design and assist you all the way to the optimum texture and finish. Incredibly the number of jobs completed over our 20 year span now amounts to well over one thousand. This covers approximately 72,000 square metres of domestic concrete! Our website provides photographs of a range of exposed aggregate blends, basic information about what you can expect from us such as our triple guarantee and the range of services we offer. There’s also a ‘frequently asked questions’ page where we unravel a lot of the mysteries of concrete such as, "why are there significant differences in price from one contractor to another?" and "are concreters actually licensed?" plus many others. You’ll also see our exclusive 5 year structural guarantee. That’s right, a structural guarantee! We are the only decorative concreting company in Melbourne that structurally guarantees their concrete driveways in writing. This is unheard of in the domestic concreting field however with our thorough processes we are able to offer the security of a structural guarantee - it’s all in the preparation and in the thoroughness and confidence of our work. With a crew of 5 concreters and an office assistant Monday to Friday, there is no job we cannot do and no query we cannot handle. We are not so large that we forget our customers and not so small that we cannot handle larger jobs. In fact, our CV includes work for esteemed companies such as The Crown Casino Complex, Westfield Shopping Centres, The Melbourne Exhibition Centre, Methodist Ladies College, Melbourne High School, ABC Child Learning Centres plus many others. Of course working for Melbourne families or businesses is our favourite because we get to deal with customers one-on-one and we have helped many over the years. Our company is divided into 7 basic divisions and we pride ourselves on having an organised business and systems in place that mean work is completed to a thorough standard time after time, and quality checks are standard for every job. With more than 35 years of industry experience, Pavetek Road Services is specialized in all the aspects of asphalt and excavation works. Being amongst the respected and trusted asphalt companies in Melbourne, we offer a comprehensive range of services that includes asphalt driveways, road profiling, asphalt paving, asphalt car parks and asphalt repairs. From preparation to the completion of your project, we offer the complete asphalt solutions. We pride ourselves in providing excellent workmanship, quality service, safety and guaranteed customer satisfaction. We are family owned and operated business and own a wide range of machineries to ensure the high end result. We provide high quality and reliable Bobcat hire service in Melbourne. Our Bobcat hire service has benefited many landscapers, builders and home owners. With us you can be assured that we’ll assist you with pavement designs, treatments and any other pavement need you have. We provide the lowest price asphalt repair service in Melbourne along with the assistance to ensure that your property retains the good condition all the time. For more information about our asphalt product and services, feel free to get us. Raj Safe Driving School offers driving lessons in Melbourne through its experienced instructors and this is why it is known as the best driving school in Melbourne, Mentone driving school, Driving school in clayton, Driving school in mentone Melbourne. Driveway professionals can install, replace and repair concrete driveways, asphalt driveways, exposed aggregate driveways and other paved areas in various materials. Before work begins on a new or replacement driveway or other paved area, a Sandringham, Victoria driveway professional will assess your property’s grade, soil and drainage. They will then help you choose from a range of poured surfaces and driveway pavers, based on your home’s style and environment. Next, they will prepare the site and operate any heavy machinery needed to build the driveway or move pavers – however, construction may not be able to happen until after other contractors have finished. Find a driveway and paving contractor on Houzz. 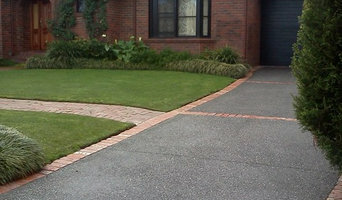 Narrow your search in the Professionals section of the website to Sandringham, Victoria Driveways. You may also look through Sandringham, Victoria photos to find examples of driveways and paving that you like, then contact the paving professional or contractor who worked on them.